Insignias have existed throughout history as signs of power, status, post, official governance, jurisdiction and belonging to an organization, in form of special emblems or objects. The most significant insignia in Ancient Greece was a goatskin — Aegis. It had been among the European emblems right up to the Contemporary period. In Ancient Rome, insignias symbolized the highest level of social status and position in form of permanent distinctions (specific types of toga, shoes, a curule seat, fasces, an equites’ golden ring etc.) and rewards (a laurel wreath, different types of crowns). The Roman insignias had a strong influence on emblems of the Christian church and symbolism of medieval monarchies. In the Middle Ages, insignias preserved their meaning, but also became regalia, that is royal insignias. Insignias (crowns, scepters, spears, swords, thrones, baculi and many more), as they were becoming attributes of some status, were recognized and interpreted as signs of the highest social levels (empire insignias, church insignias). The typical insignias were crowns and scepters; they were used during inaugural and other solemn ceremonies, both personal and corporate. The issue discusses both ancient and modern regalia as well as social and political circumstances of their existence. 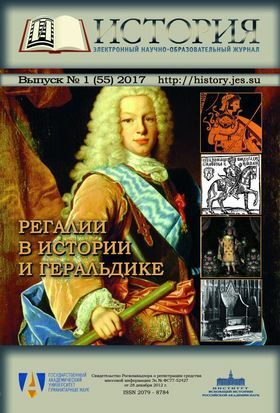 The issue is prepared in the work of the Centre for Studies in Heraldry and Genealogy of the Institute of World History, Russian Academy of Sciences. Aegis: a Skin/Shield — a Trophy — an Apotrope — a Symbol of Power?